Imagine if we literally took ten steps beyond a flood line. How much damage to homes and amenities could be prevented? In Bristol ten steps away from our tidal waters would make a massive difference. We don’t have the capacity to physically do this, but we can offer news of ten steps towards greater flood awareness and resilience. We hope you enjoy, join in and share! There are ideas brewing among some of our documenters about how to exhibit our wonderful photos, videos and audio and tell the story in new and exciting ways. Ideas include films long, short and 3D exhibitions, in community centres and galleries along the line. We also want to Bristol as a gallery with giant photos and messages about flood risk displayed on the outside buildings. We are seeking funding, sponsorship or in kind donations to make these projects happen! In the meantime a UWE second year photography student, Rachel Mason, has been inspired by the line to create a unique story, ‘This photobook is my interpretation of the line, its connection to the land and my personal journey along it. With the feeling of being submerged underwater, my images carry on this conversation providing a different understanding of the purpose the line holds’. The wonderful folk of Ashton have plans to re-open the Colliters Brook below Greville Smyth Park. They used HighWaterLine to start talking about it and to meet UWE engineers to help them understand what was possible. “Re-opening Colliters Brook as it runs through Greville Smyth Park has many potential benefits. It could create a new habitat for wildlife and improve the appearance of the park, but more importantly it could also provide a sustainable drainage system that could help mitigate against the risk of flood caused by more frequent and intense periods of heavy rain. We’ve been making contacts with local people, Earthed, residents of Bower Ashton Terrace and the Boys Football club. We’ve also had a positive response back from Wessex Water about the possibility of opening the pumping stations for tours next year to coincide with our event in the park focusing on the possibility of re-opening Colliters Brook” Matt Symonds. Hotwells & Cliftonwood Community Association AGM with Bristol City Council Flood risk team presented HighWaterLine and flood resilience measures in Hotwells on 18th November 2014 to an audience of nearly 50 people. What effects Hotwells impacts the centre of the city, and members of the public had many questions including why we drew the line where we did, rumours of proposals for a barrage in the Avon and whether lowering the harbour level to increase capacity would increase current defences..
Anna and Izzy have been enlisted to share the story of the project with the Environment Agency, both locally and nationally, in an effort to introduce new creative dimensions to their community engagement. We’re planning presentations and producing an evaluation based on feedback from participants, authorities, community organisations and the general public. We also continue to communicate with Bristol City Council Flood Risk Team and urge others to do the same. Izzy and Anna are working with the global HighWaterLine coordinators on a community guide for inspiring others to do mark their own HighWaterLine, based on what we’ve learned in New York, Miami, Bristol and Philadelphia. The guide is designed to accompany training for communities. Some of our HWL community have come forward to help be part of a ‘core group’ who will look after and nurture steps beyond the line. We are having our first get together in January to discuss the future of community flood resilience in Bristol. Izzy was shortlisted as Bristol Green Volunteer Co-ordinator of the year by the Bristol Green Volunteer Awards! A short film made by i say Raar for Invisible Dust, about HighWaterLine is now showing at the National Maritime Museum in Greenwich, London, attracting an international audience! And talking of international, the community members behind HighWaterLine Miami just secured a grant to collaborate with other Miami groups to build community resiliency to extreme storms and sea-level rise fueled by climate change. Well done to them across the pond! So many West Country universities are exploring flood resilience and climate change adaptation and some people involved in HighWaterLine are partnering some of these. A great example is Seila Fernández Arconada and Prof Thorsten Wagener of the Water and Environmental Engineering Research group with Land of the Sumer People. More, please! HighWaterLine is a project open to all! If you want to get involved, ask further questions or anything else relevant, e-mail hwlbristol@gmail.com. I live in a flood risk zone, less than 5 metres away from the River Avon, which has the second highest tidal range in the world. On New Years Eve 2013, we and our neighbours received a letter from the local authority warning of flooding and advising emergency procedures. 2014 began with the west coast of the UK being pounded by torrential storms, the Somerset levels became inland seas and people fled their homes under threat of inundation. Massive storm surges combined with the highest tides for nearly 20 years. The surges battered our coastlines and disrupted lives across the country. We were shocked and relieved all at once. 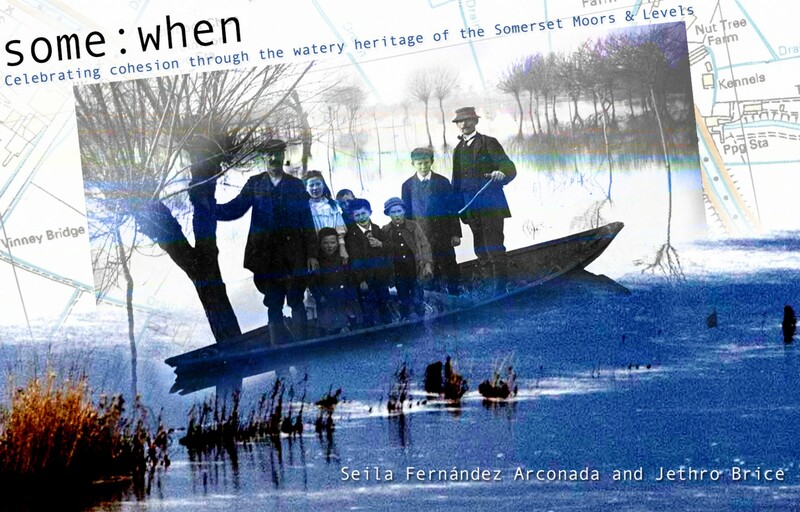 The family of 10 in the end house had been flooded out at the beginning of the millennium, evacuated for 4 months, separated and housed and schooled in other parts of Bristol and even other cities. I can’t imagine how I would feel if my kids had to be apart from us or each other for that long. On January 3rd we awoke to the river pooling against the flood barrier. Surprised and alarmed, all the neighbours gathered together and walked down the street. Together we watched water cascade over the harbour wall by the Pump House. There were swans swimming in a local car park. TV cameras came, flood tourists invaded. The twice daily threat of flooding over 72 hours left us exhausted. As the last high tide flowed out to sea in mid March we felt relieved, but confused. We thought we understood the river and the risks. A few days later I came across HighWaterLine by chance and felt I had found a way to answer our questions. Over the following months I joined the growing number of Bristolians who live or work on the line. We spent many hours discussing the risks, examining the maps, the data and what it all meant for us. We devised ways to work together to draw our pale blue line. Chalking the line was scary but exciting. We had hundreds of conversations with people all over the city – explaining how Bristol has an amazing system of water management, engineered early in the 1800’s, designed to float boats, it also serves as our primary tidal flood defence. In other areas chalkers discussed underground rivers and drains. Conversations flowed to include other climate change anxieties and the adaptations we could make. What threat do changing water levels bring to communities at risk? What can communities do to help themselves and inform others? What can we do to get the authorities to work with us on solutions and treat us as equal ‘experts’ ? Here in Bristol we believe we have found a way to work together and we want to continue sharing our knowledge to help communities build resilient solutions and share our experiences with the world. As I left the house one morning in early November, workmen were knocking down the wall of our neighbours’ house. These neighbours have endured flooding and evacuation. The local authority are re-building resilient defences that the Georgian’s integrated into the design by strengthening the wall and putting in a flood gate. A small construction job will save a family of 11 from being re-housed and £1000’s of pounds worth of public money. There are a lot of smiles on our street today! Do you live in a flood risk zone? Do you talk to your neighbours about your worries? If you would like support or information please get in touch. We are working together with individuals and community groups affected by the floods to support and amplify the remarkable resilience of Somerset communities in responding creatively to the floods. While the Media have often presented the floods as a matter of division and controversy, we have been struck by the voices from the ground which have worked to develop shared responses to the crisis. Working with local groups in and around Langport, we will create a replica of the traditional Somerset Flatner from reclaimed materials, sourced in the immediate environment. Designed as a practical and affordable solution for navigating life in a changeable environment, this characteristic Somerset boat is an iconic local design that represents the centrality of both water and human ingenuity in shaping the history of life on the levels. The boat will be fitted out with a bright and decorative sail compiled from the collected stories of children and young people affected by the floods. Through creative, participatory workshops they will be encouraged to share and reflect on their experiences and articulate a vision of Somerset’s future. Local groups are invited to accompany the Flatner on a triumphant journey from Langport to Bridgwater on the outgoing tide. We will liaise with both local and national press and charities and national organisations to raise the profile of the event and present a refreshingly positive story that better represents the joint voices of the Levels. As artists who work with people and nature, we have experience working with communities to address social and environmental issues through creative collaboration. We both have a long-standing interest in the Somerset Moors and Levels, and we have been following conversations on twitter, facebook and in the local press, as well as the formation of the 2030 vision statement from the Levels and Moors Task Force. We believe it is important to make visible the strong voices of Somerset people, working together to respond to the challenges of flooding. Flat Earth? Flat St Werburghs! I live in St Werbughs. If you live here too, or if you’ve ever visited, you’ll know that flatness is something of a state of mind. Trundling around on a bike is incredibly relaxed – no Nine Tree Hill or St Michaels Hill here! It causes me to pause and consider how vulnerable we are as a community. You will probably have seen the historical flood markers dotted around the place. They mark the 1882 flood in which three inches of rain fell within 48 hours. And as recently as 1958, there were ankle-deep floods here in St Werburghs. These events and signposts are a reminder that before proper drainage came along, many many more communities were immediately vulnerable to the extremities and ravages of nature in Bristol. Other than the right drainage – which thankfully we now have – how else can we build resilience into our communities? The HighWaterLine art project is a visual way of reminding us of our vulnerability and of the imagination and creativity that is needed to combat the country’s biggest national security threat – climate change. All communities must talk about this and adapt to changed and changing circumstances. Harnessing the power of water is one way we can build that resilience into our community’s life. The streams and gullies that run through Ashley Vale – from the Boiling Wells, to the Horfield Brook that runs through Mina Road Park – may have lost a bit of their kick, but it’s clear that hydro-electric power will be a key factor in building an economically sustainable energy system for the future. And thinking slightly wider, we must all come to recognise the great natural resources we have in Bristol. Combining flood prevention with power generation in the City Docks, and in the Severn and Avon estuaries, is a huge possibility for us. The UK has such vast natural renewable resources of wind, wave, water that are still largely untapped. We still need the long-sought renewables revolution to protect us from and bring us into closer contact with the planet that we are sustained by. As we chalk and paint the line in the coming days, connecting communities across Bristol and getting to grips with each others’ views on climate change, let’s think of more ways to ensure that our beloved (and flat!) landscape is one that remains a relaxed environment, and not a torrent of problems. A new 32 mile long artwork highlighting the need for building flood resilience defences around the UK will be launched on Tuesday the 9th of September in Bristol. Hundreds of Bristol residents are expected to take part. On Tuesday the 9th of September Bristol residents will be taking to the streets themselves to draw a continuous 32 mile chalk line through their city finishing on the 21st of September. The resulting drawing will the largest artwork ever commissioned in the UK. Organisers are appealing for owners of drones and other aerial photographers to capture the work from the air. Bristol residents have embraced the project and have been working together for the past 6 months researching how to make the city more climate resilient. It has been shown, in examples of extreme weather events around the world such as hurricanes Katrina and Sandy, that preparation would have saved lives and property. Knowledge of the high water mark for an area is particularly useful when making preparations for flood surges. New scientific reports relating to flooding in Bristol has until now been largely ignored but is now starting to be taken seriously gaining traction as the HighWaterLine project gathers pace. The new artwork will show the maximum rise of a body of water over Bristol as the result of flooding. Originally initiated by the artist Eve Mosher, the project entitled HighWaterLine has expanded globally in a partnership with Heidi Quante of Creative Catalysts. This is the first time it has come to the UK. Residents from each Bristol neighbourhood will mark a section of the 32 mile route before handing on to the next to show what the city will look like underwater. Eve Mosher’s initial ‘HighWaterLine’ public artwork involved the artist herself marking out a line 10-foot above sea level around the coast of New York City. Whilst en route the artist engaged inquisitive local people in conversations about flooding, climate change and its potential impacts. When subsequently parts of the route were flooded after Hurricane Sandy in October 2012 and the artist was proved right, people began to see her artworks as innovative ways to visualize the future impacts of climate change. The partnership with Creative Catalysts, who are collaborating with communities around the world to use art as an innovative way to spark solutions to climate change, has deepened the impact of HighWaterLine as a tool of engagement. In 2013 in Miami residents created a line the length of a marathon (26 miles) that showed houses and historic buildings that could potentially be underwater in future. Since then the project has become international and community driven. Most people are unaware of the threat they are facing. Eve Mosher’s long term vision is for communities to be empowered by replicating her original project in their own cities around the world. HighWaterLine | Bristol is funded by Arts Council England and LUSH Charity Pot. The global HighWaterLine project has been supported by The Compton Foundation and Invoking the Pause. 16th September: History Walk: Water in St Werburghs: Past, Present & Future. Eve Mosher is an artist and interventionist living and working in New York City. Her works use investigations of the landscape as starting points for audience exploration of urban issues. Her public works raise issues of involvement in the environment, public/private space use, history of place, cultural and social issues and our own understanding of the urban ecosystem. Her work has been profiled in international media including the The New Yorker, New York Times, ARTnews, Miami Herald, L’uomo Vogue, and Le Monde. Her public and community based artworks have received grants from New York State Council on the Arts and New York Department of Cultural Affairs, both through the Brooklyn Arts Council, and The City Parks Foundation. Collaborative works with Heidi Quante (Creative Catalysts) have received support from The Kresge Foundation, The Compton Foundation, The 11th Hour Foundation, The Whitman Foundation, and Invoking the Pause. She has a serious interest in urban ecologies and sustainable development. Invisible Dust is a commissioning organisation that works with leading artists and scientists to produce new and exciting works of contemporary art. It provides the opportunity for both disciplines to share and explore common ground on environmental themes. Currently Invisible Dust is working in three leading UK Museums. Turner Prize 2012 winner Elizabeth Price is collaborating with a space scientist at the Royal Observatory, artists Owl Project are in residence with the Manchester Museum and Laura Harrington is creating a film about peat bogs for Woodhorn Museum, Northumberland. Invisible Dust aims to produce significant and far reaching artists commissions in the Public Realm both in the UK and internationally, as well as supporting the creation of new scientific ideas whilst engaging audiences with large scale events, education and community activities. It was founded by Alice Sharp who previously managed the Fourth Plinth and has worked as an Independent Curator since 1997. Creative Catalysts brings together experts from diverse disciplines: art, science, experiential learning, storytelling and multi-media to design innovative ways to raise awareness, inspire dialogue and spark action on pressing social and environmental issues. Our passion is to engage people where they live, work and play in order to engage diverse sectors of our society in greater social change.